Your new cabinets are an investment, and with minimal care you can keep them looking as lovely as the day they were installed. 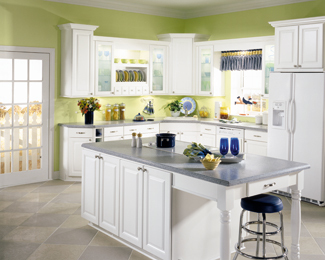 Here are some basic cabinet maintenance suggestions. Your cabinet door and drawer fronts are hardwood, and deserve the care you give to fine furniture. Be sure to remove any splatters or spills immediately to avoid damage to the finish. Dust your cabinets with a soft cloth. You can dampen the cloth very slightly or spray the cloth with a dust remover. You can also clean the interior of your cabinets occasionally the same way. If you wish, you can polish any wood and laminate surfaces with a good non-oil based furniture polish a few times a year. Don’t use paste wax or polishes with silicone. They can create a wax build-up that is hard to remove. The residue will attract dust and make your cabinet finish look dull. Never use any other types of cleaners or polishes on your cabinets including bleach, detergents, citrus-based cleaners, ammonia-based cleaners, steel wool, soap pads, or abrasive cleaners. These will damage the wood finish, possibly beyond repair. Check with your manufacturer for cleaning products recommended for your cabinetry. Use a putty stick, available at hardware stores, to cover minor scratches. Putty sticks are available in tones to match every cabinet finish. Be cautious about positioning small appliances that generate heat such as coffee makers and toasters. Cabinet finishes cannot handle temperatures higher than 174° Fahrenheit without damage to their finish. Don’t position or mount those appliances where those temperatures can reach your cabinet doors and drawers. 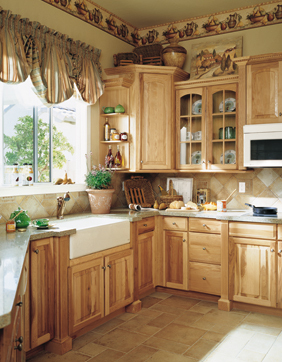 Temperature and humidity changes can affect your wood cabinetry. As a result, on occasion your drawers may stick and your doors may not close properly. You may experience a normal separation between your countertop and the wall over time. Use caulk to seal those places to protect against water damage. If you have glass cabinet doors, to clean the glass spray glass cleaner on a cloth first rather than directly on the mounted glass. Glass cleaner can seep into the area behind the connectors and discolor the wood.